Looking for the highlights of Prenzlauer Berg? Well, look no further: Prenzlauer Berg is the highlight. Locals and visitors mingle on the street and join for drinks and talk in bars. Broad esplanade-style streets invite people from every corner of the world. The most exciting spots are where the history of Prenzlauer Berg meets the now. Be sure to read about our favorites. One of the most enchanting spots, the „Platz am Wasserturm“ is the signature landmark of Prenzlauer Berg among the locals. The brick-walled water tower is surrounded by an elevated plateau and its lawn offers a perfect opportunity to relax and have a picnic. Built in 1877 and operated until 1952 this is the oldest water tower in Berlin. During summer time it serves as location for numerous concerts. The former water basin serves gardeners as an area to grow roses – and grapes! Urban winemakers use these grapes to produce a rare riesling from Prenzlauer Berg. If you’re lucky you might get the opportunity of a guided tour and learn about the wine and the history of the place. The place’s beauty is best enjoyed on a summer night, offering not only the scent of roses but also a beautiful view as far as the synagogue in Oranienburger Straße or the „Fernsehturm“. A gem in the heart of tenements of Berlin’s famous era „Gründerzeit“. With a total length of 2.8 km (4.5 miles) the buzzing Schönhauser Allee links the districts of Mitte and Pankow (of which Prenzlauer Berg is a quarter). This vibrant boulevard combines many amenities and sights. Where else can you find this many cafés, shops, restaurants, historic sites and backdrops for movies. If you feel like shopping, head to the southern part of Schönhauser Allee. At Senefelder Platz you will find a small park with an almost hidden gem: a monument of Alois Senefelder, inventor of lithography. Close-by the Jewish cemetery bears witness to the once rich influence Jewish culture had on the neighborhood of Kollwitz-Kiez. Further to north, where the subway emerges to its viaduct, Prenzlauer Berg presents itself as lively, vibrant and colorful. The Kulturbrauerei, a former brewery, now hosts theatre, cinemas, bars and shops. Follow Oderberger Straße, which leads right to Mauerpark. This rather small street boasts trendy shops, popular cafés and no-frills fast-food stands. 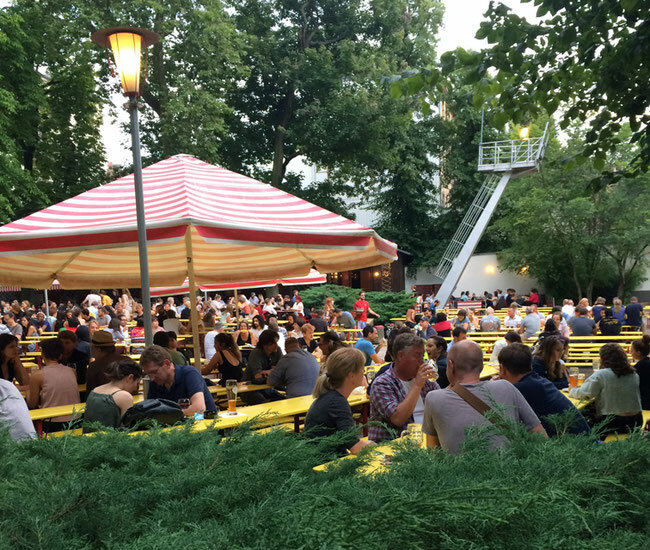 Enjoy two of the best beer gardens right in Prenzlauer Berg. Prater, at the corner of Danziger Straße/Kastanienallee is the oldest in Berlin, serving beer for over 180 years. Starting as a wooden shack it developed into a site for music and vaudeville shows. Pfefferberg towers over Schönhauser Allee. 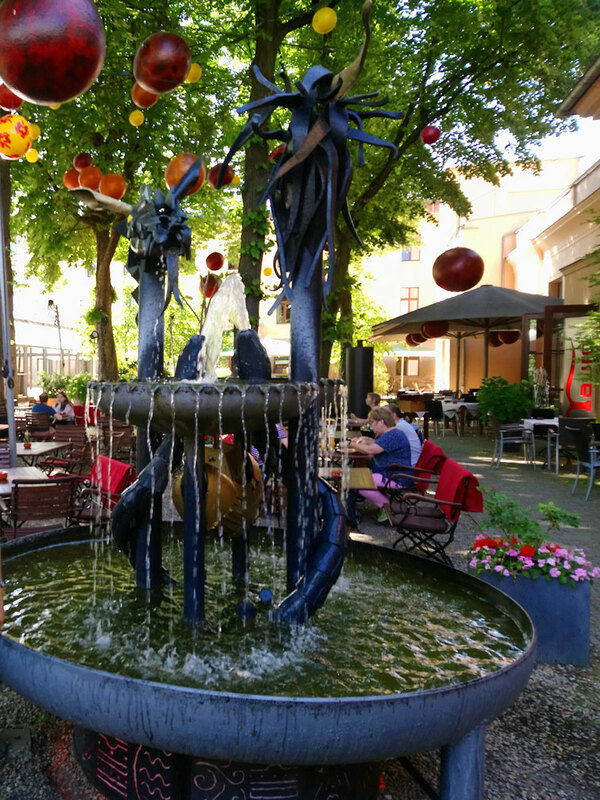 The beautiful fountain of this beer garden provides a little bit of cool on hot days along with the many trees which provide a cozy shelter from the summer sun. Although in the midst of Prenzlauer Berg-life this beer garden provides a retreat from the noise and bubbly life of Schönhauser Allee. Be sure to taste the home-brewed beer. 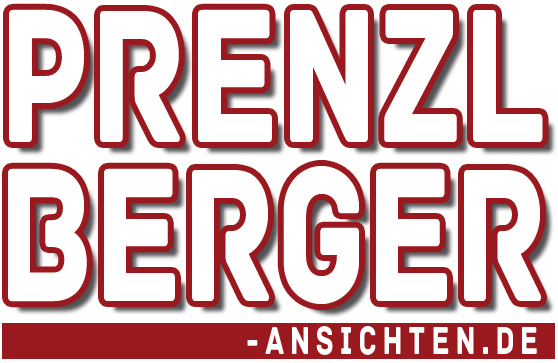 Prenzlauer Berg is a multicultural quarter of 10.9 km2, housing 160.000 people on 10,9 km2 Fläche. Of the 15 neighborhoods the most renowned are Kollwitz-Kiez, Helmholtz-Kiez and Bötzow-Kiez („Kiez being the traditional Berlin term for „neighborhood“ in terms of an area). Here you’ll find the largest area of Gründerzeit architecture in all of Europe, with the youngest population, countless cultural offerings and a rich history.